The sight of dead animals lying on the road with their tongues hanging out and a trickle of blood flowing from their head, with no predator or attacker anywhere to be seen, is becoming all to familiar in the Kruger National Park. Spend anytime in the famous reserve, these days, and the secret killer responsible for this unacceptable trend will expose itself to you within minutes of entering the gate. Upon arrival, as you release your first sigh of satisfaction for having reached this sanctuary of wildlife conservation, you are virtually guaranteed to be run off the road at a break neck speed before sighting your first animal. The culprits will be one of the following: 1) staff taxis, 2) SANPARKS vehicles 3) delivery trucks, 4) private tour operator game drive vehicles 5) speeding visitors racing to the next sighting reported on one of the popular animal sighting apps. Public scrutiny was recently drawn to this disturbing trend when a graphic picture of a cheetah with glazed eyes, lying dead on a tar road in the Kruger National Park surfaced. Immediately clear that this critically endangered animal had sustained severe trauma from a speeding vehicle, the outcry was loud and necessary. One needs not spend extended time within the reserve to know that this type of incident happens frequently. Far more frequently, than park officials would be willing to admit. Most young adults who visited the reserve during childhood, will fondly remember a Kruger road culture which has sadly been lost. Past days would see road users waving to one another as they crawled past in opposite directions, eyes “peeled” and fixed on the bush searching for the smallest sign of life. Visitors would regularly stop and have a friendly chat through vehicle windows about their respective sightings during the drive. In todays times, with visitors racing around using the latest animal sighting apps, game spotting seems a thing of the past. Visitors are unfortunately only a small part of the problem. One could be forgiven for thinking they were on a national highway when spending time in the Kruger National Park. The traffic of vehicles, which are not paying visitors in the reserve but rather staff taxis, trucks and other non-game viewing vehicles is staggering. It begs the question of whether Kruger is moving forward as a sanctuary for wildlife conservation or whether it is a growing town ready to boom with an expanding population of… not wildlife but people. Skukuza is the capital camp of the game reserve and the permanent population in 2011 of the staff compound was 1599 people according to Wikipedia. I have unconfirmed reports that the real number is actually well over 2000 today. This refers to the permanent people living in Skukuza, and does not count the number of holiday makers. According to WheretoStay, Skukuza camp can accommodate around 300 tourists at capacity. Skukuza is just one of 23 camps in the Kruger National Park offering holiday accommodation. The reserve also allows a staggering number of day visitors into its boundaries. One only has to have the unpleasant experience of being there on a public holiday to know unquestionably that the numbers of people allowed within the reserve at once is out of control. There is little in the way of conduct or policing which is desperately necessary when dealing with these types of numbers. With safari and eco-tourism growing at an encouraging pace, we certainly have a lot of reasons to be excited about conservation through eco-tourism. However, allowing the levels of traffic to increase unabated is not working to achieve the goal of conservation through eco-tourism. It needs appropriate management for the numbers of people moving through the reserve. The solutions do not seem impossible. Visitors – Ditch the Sighting Apps. Kruger used to be a sanctuary to escape the noise of technology. Today people are using user driven apps which update the latest sightings from anywhere in the reserve. The result is people speeding between sightings and doing no actual animal spotting for themselves. A great idea in theory but the result has been anything but positive. Now this may be a tall ask but the reality is it is not pleasant for anyone to see the road blocked by severe traffic attempting to view a sleeping lion. It is common these days to see people climbing out of their cars in traffic to walk into the sighting for a “better view”. Incidents of road rage in such sightings occur daily, counter to the spirit of this reserve. Who can forget the sad video of a Kudu bull slipping on the road and being caught by two male lions after it’s escape was blocked by traffic. No one wants to see that… Well, no one who belongs in the park should want to see a kill happen in such an unnatural way. Visitors need to take more responsibility for their own behaviour. There used to be a wonderful, sharing culture in the Kruger. Today it feels like the streets of Johannesburg with everyone selfishly trying to beat the people in the other car, refusing to give way. Every vehicle, which enters the reserve in any official capacity must be approved and fitted with a tracking device. Driving can be monitored at all times and if the rules are broken the consequences must be real and immediate. We cannot afford to lose any more Cheetah. The greatest culprits of poor driving are undoubtedly the staff taxis and the trucks. Every regular visitor to the reserve will be able to recount many scenarios of herds or groups of animals on the roads being chased off by heavy vehicles blasting through the cars and awkwardly dodging fleeing animals. If the drivers of these vehicles are prepared to behave in such a way with other tourist vehicles around, it begs the question of how they behave when there are no tourist vehicles around. Tracking these vehicles driving behaviour is an easy and necessary solution. The Kruger National Park is one of the largest managed conservation areas in the world. It is a leader in conservation science and an example of successful management protocols. The image of a critically endangered animal lying dead in the road with eyes glazed is a very negative one and correctly calls into question how this problem is being managed. For a long time seasoned visitors have been complaining about the declining culture on the roads in the reserve. 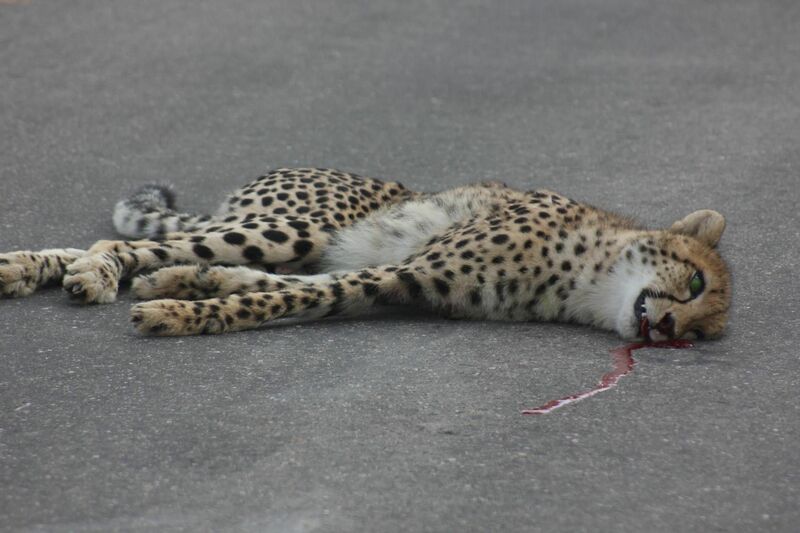 This Cheetah and the countless other road kill images pouring out of the park must be the catalyst to force management to address this issue in the strongest possible terms. Correct road culture should be lead from the front by those who represent the Kruger National Park… the staff.